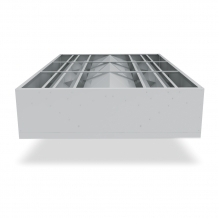 Powered by nature, Airocle’s range of high capacity roof vents have been specifically designed to provide project designers of large scale industrial buildings with maximum exhaust flow, yet sustainable ventilation schemes. Using natural forces such as thermodynamic and venturi effects, our roof vents offer the perfect solution to effectively and naturally evacuate excess heat or fumes from the building atmosphere. 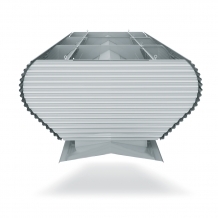 Airocle’s vents have been rigorously tested and achieved high coefficient of discharge that will satisfy ventilation needs of the most demanding buildings. Based on over 30 years of research and development, our roof vents incorporate innovative aerodynamic design principles resulting in low profile and light weight units to ensure minimum wind load on your building structure. Highly versatile, our high capacity roof vents can be customised to your ventilation requirements, roof profiles, building structure and exposure from the elements to offer a cost effective yet sustainable solution for your projects. Low Profile and weight offering a decrease in wind load on building structure. Versatile solution to accommodate most roof profiles, building structures and ventilation needs. Building Code of Australia (BCA) compliant.